10. The voices in her head. 9. The redundant messages from the voices in her head. 8. The changing messages of the voices in her head. 7. The amount of voices in her head. 6. The laughter of the voices in her head. 5. The laughter of a bunch of folks here at MDN. 4. The laughter of the folks once the 2nd Circuit reverses her outright and ends the case, Apple would pay nothing. 3. Another bad hair day. 2. Finding a tin foil hat that fits. 11. Her Amazon shares tanking. Oh yes, that’s gotta hurt….and the hits just keep on coming. Thanks, made my day. I’m concerned too. It should be $0. Has anyone asked her about her opinion on Amazon’s bullying?!? So, when a puppet speaks, whose voice is doing the actual speaking? Immediately Bezos comes to mind. Spooky speech at a distance? The tangled web of deceit. 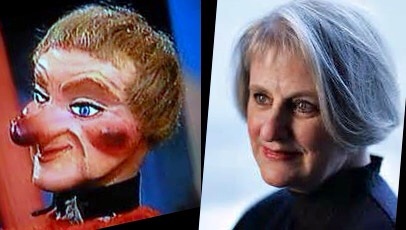 US federal puppet should be the actual title she’s given. It fits so perfectly. Good grief. If her ruling is overturned by the appeals court, even if on a small technicality, it’s still overturned! Amazing.